Only 10 percent know the First Amendment guarantees the freedom of the press. And 33 percent of Americans have no idea at all what rights the First Amendment guarantees. The Newseum Institute survey conducted by Dr. Ken Dautrich, president of the Stats Group, interviewed 1,002 American adults from May 14 through 23. The survey had a margin of error of +/- 3.2 percentage points. 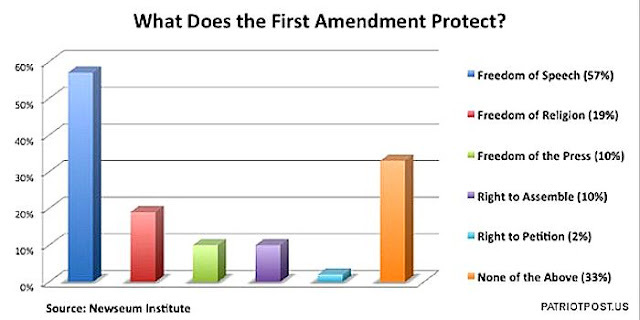 Fifty-seven percent were able to say that the First Amendment guarantees the freedom of speech. But only 19 percent were able to say that it guarantees freedom of religion. Only 10 percent were able to say it guarantees freedom of the press. Only 10 percent were able to say it guarantees the right of assembly, and only 2 percent were able to say it guarantees the right to petition. Thirty-three percent of the Americans surveyed were unable to cite a single right that was guaranteed by the First Amendment.